This week, we sat down with Fyber’s Director of Product, Programmatic, Lars Radmacher. Based in Berlin, Lars and his the team are the driving force behind Fyber’s Video SSP and Programmatic Exchange, which launched earlier this year and was further strengthened by the acquisition of Falk Realtime. The launch of the RTB exchange not only allows advertisers to better target the premium, in-app inventory offered through Fyber’s SSP, but also offers our publishers the opportunity to maximize their eCPMs, boost fill, and open up their inventory to additional demand streams, all of which compete with mediated networks to serve the highest-paying ad. While Lars was visiting us in sunny SF, we took the opportunity to pick his brain on the current state of programmatic, where he thinks the industry is heading, and what both advertisers and developers need to know about this rapidly-expanding market. TC: Let’s start with a broad question: What do you think is most relevant for advertisers to know about programmatic right now? LR: I think it’s important for advertisers to really understand the broad capabilities of programmatic and RTB. First of all, programmatic makes it feasible for advertisers to reach close to all of their campaign goals by allowing them to select and target, on a per-impression basis, exactly the audience they are trying to reach. Secondly, from a technological point of view, programmatic provides the most efficient communication between systems. Finally, programmatic provides advertisers with transparency into exactly the kind of traffic they are buying, and ensures that they are bidding on unique inventory that wouldn’t be duplicated by another SSP or video SSP. All of these capabilities help advertisers understand how they can spend their budgets most efficiently over all channels of supply. TC: Over the past year, a lot of big brands have jumped on the “programmatic bandwagon”, so to speak. How do you think this influx of marketing dollars is going to affect the programmatic landscape in the coming year? LR: There’s no doubt that we’re seeing huge growth in programmatic, particularly on mobile. Compared to the growth of classical ad serving, it’s gaining steam much faster. So for advertisers, this means that more and more inventory is becoming available, which allows them to better distribute their budgets across supply sources. Plus, programmatic technology enables them to achieve much more sophisticated targeting, reaching – on a per-impression basis – the right user, at the right time, in the right environment. Finally, there’s the efficiency aspect: Programmatic simply makes it easier for advertisers to purchase exactly the inventory they are trying to reach, in an automated fashion. TC: Are there any ad formats that you think will see particular growth? LR: In the early days, the focus – and indeed, the reputation – of programmatic was to fill remnant inventory. In other words, to deliver lower-paying ad units, such as banners, that were intended to fill whatever leftover inventory the publisher had after cycling through other demand sources. However, as programmatic technologies have matured and the industry is realizing the many benefits of RTB exchanges, there has been a shift towards the programmatic buying and selling of higher-quality ad formats. Publishers are beginning to see that programmatic isn’t just about fill; Rather, it enables a more efficient and targeted selling of all kinds of formats, including video, full-screen interstitials, rich media, and native ads. But part of what is influencing this shift is not only the move towards higher performance formats, but also towards more premium inventory. Publishers, understanding that they can achieve higher eCPMs through the improved targeting offered by cross-platform and mobile programmatic, are opening up their inventory and creating a marketplace that offers higher-quality and more unique traffic. TC: Going back to what you had said about the reputation programmatic once had for primarily being a source of fill for remnant inventory – do you think that there is now a common understanding on the supply side, as well as the demand side, of its true capabilities? LR: Yes, I do. On the supply side, I think that publishers are quickly recognizing that the cross platform and mobile programmatic landscape is changing and that it isn’t just about fill anymore. For example, it enables publishers to sell their premium inventory, without requiring the force of a dedicated direct sales team. In addition, it opens the door for smaller publishers to tap into the budgets of larger advertisers which they normally wouldn’t be able to access. 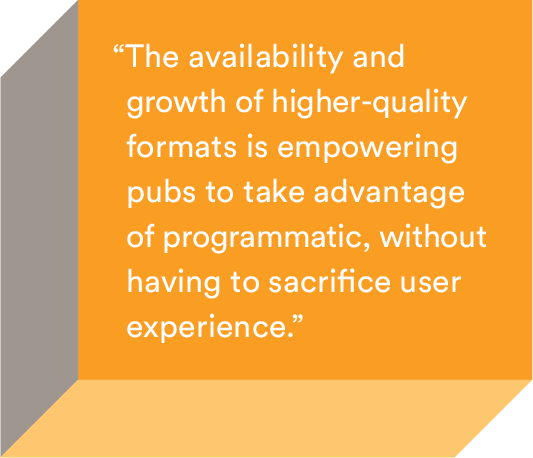 Plus, the availability and growth of higher-quality formats is empowering pubs to take advantage of programmatic, without having to sacrifice user experience. And finally, the data transparency and granular targeting afforded by programmatic not only provides users with more relevant ad experiences, but also offers the potential to boost eCPMs for publishers as advertisers can buy into exactly the audience that is valuable for them. TC: Speaking of transparency, do you think that programmatic is delivering on its goal of increased transparency? LR: Yes, I think it is, for sure. Particularly in the in-app environment, I think that publishers are very flexible and well-educated on the capabilities of programmatic, and how to maximize these to both their benefit and to the benefit of the advertiser. As we all know, mobile programmatic can only be successful if publishers are willing to share certain data points with their demand partners. But I think that publishers truly recognize the value of doing so and are willing to test which kinds of targeting work best for their inventory. In the past, higher eCPM deals were traditionally executed through the direct sales. But in order to achieve this, publishers have to employ in-house sales teams, which costs both time and money. Programmatic takes this out of their hands, allowing them to optimize the sale of their premium inventory, without having to manage it directly. As a result, I believe that publishers – particularly those offering in-app inventory – understand the value of the data they have and are smart about controlling what to share, and at which price point to share it. I believe that they recognize that increased transparency opens them up to much bigger budgets from advertisers. TC: Speaking of supply-side benefits, in your opinion, what are some of the biggest benefits of mobile programmatic for a developer? And what are some things a developer can do to maximize their returns if they choose to sell their inventory programmatically? LR: Again, certainly access to larger budgets. Particularly now that most agencies are using, or exclusively using, programmatic to execute their media buys. Second, increased efficiency, as the SSP manages all contracts with DSPs and provides optimization to ensure the pub is served with the highest-paying bid. Third, increased competition, which equates to better returns for the pub. By selecting the right SSP, publishers have the ability to open themselves up to hundreds of thousands of advertisers, many of whom bring larger budgets to the table that smaller publishers would otherwise not have access to. TC: Final question. As we know, a large percentage of mobile advertising dollars are dedicated to user acquisition. What are some ways that developers can incorporate mobile programmatic into their UA strategy? LR: The benefit of mobile programmatic to UA advertisers is that it really allows them to target exactly the kind of user they are trying to acquire. Based on the data shared by the SSP, you can specifically pick out the users you want to target, and access this kind of inventory at scale. Plus, third-party tracking providers allow you to go a step further and re-target your ads to the specific users you want to re-engage. This helps you build out a more robust and focused UA strategy, rather than hoping to reach your intended audience through a more traditional form of media buying. Many thanks to Lars for sitting down with us! If you’re interested in joining Fyber’s Programmatic Exchange as an advertiser, please contact [email protected]. Developers that would like to learn more about the benefits of Fyber’s SSP, including our Programmatic Exchange, should reach out to [email protected].